Using flour in the recipe was questionable from the beginning, and the dried finished bowls are fine. 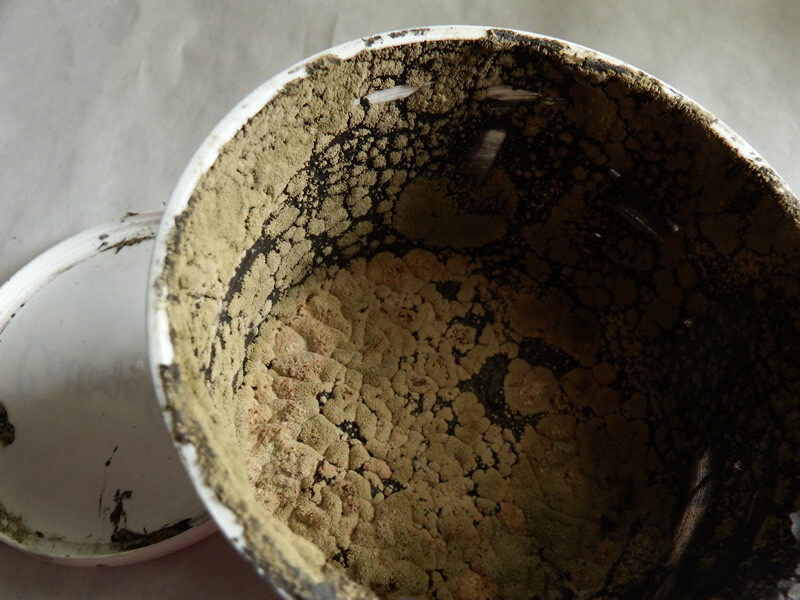 I think that could be the culprit, although joint compound can also get moldy. The container was tightly sealed, but the weather has been hot and humid, so perfect conditions for growth. Wish I listened better in Microbiology class, I might be able to identify it. 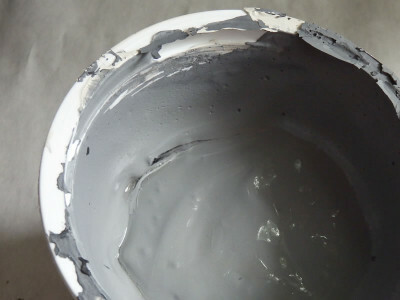 In the search for clues, I opened another container of gray finish coat material and there’s no apparent mold at all. Finding any mold at all makes me think it’s sensible to either use all the material shortly after you make it (if you work with the recipe as is), or substitute the flour with a different thickener. Next on the experimental list for this material is trying it maybe with some plaster substituted for the flour. The biggest issue, besides the waste, is that if you don’t measure everything carefully (I didn’t) and you try to mix some more, getting the color to match the earlier batch will be a challenge. So unless your idea of DIY involves making your own petri dishes from scratch, or developing the next antibiotic, try to estimate how much you’ll need and use it quickly. I’ll report back on the plaster substitution, the next time I make bowls.